Morning... June really is wedding season and I have a couple to attend over the next few weeks so I thought I would share this little card I made for a friend who eloped a few weeks ago.. I kept this card really simple using the Wonderful Life set from Stampin Up. I stamped the image using my MISTI then added the additions to it... the cans and the number plate. 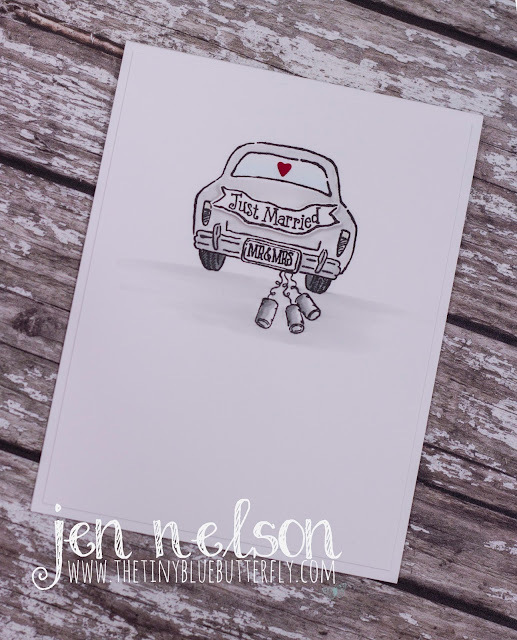 I stamped the Just Married onto a scrap of card stock and then fussy cut it out and added it onto the image using foam tape. I coloured it in using some pale grey copic markers as it looked a bit flat without the colour wash. The white panel is then mounted flat onto a card base as it needed to be posted and arrive without getting squashed.